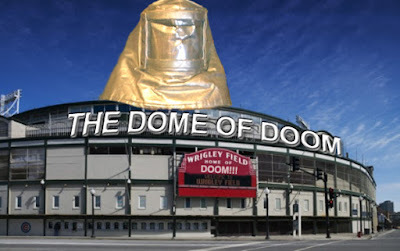 Zoltrog's Blog: Zoltrog Wishes For Earth City Chicago To Ignore Their Cubs And Instead Provide Zoltrog With $300 Million To Construct "Zoltrog's Dome Of Doom"
Zoltrog Wishes For Earth City Chicago To Ignore Their Cubs And Instead Provide Zoltrog With $300 Million To Construct "Zoltrog's Dome Of Doom"
Today on Earth, Earth baseball team Chicago Cubs asked their city for $300 million dollars in Earth money in order to update their battle stadium Wrigley Field. This concept of Earth cities providing money to build stadiums where sport can be viewed is intriguing to Zoltrog. Zoltrog feels he wants in on this Earth action. Therefore Zoltrog is asking for an American city to provide Zoltrog with the funds and location he requires to construct a dome which will contain unspeakable horrors. Unspeakable horrors that Zoltrog believes Americans would pay a great deal to see and partake in. For proof, you need look no further than the Earth television program American Idol. All Zoltrog asks is for a charitable U.S. city to provide -- albeit against its own best interest -- Zoltrog with a great deal of Earth money so that Zoltrog can create a great deal of Earth entertainment as well as a proportional amount of Earth chaos. All at modest Earth prices fit for a standard Earth family. ...only much cooler, heaping with horror and cascading with destruction. Zoltrog's "Dome of Doom" will make Earthlings that much more comfortable with the doom and destruction Zoltrog will bring them when he rules your planet. It will be an Earth taste of Earth things to come, mwahaha!